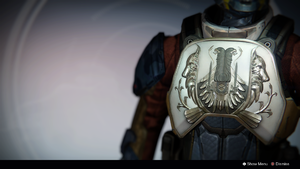 Crest of Alpha Lupi is an exotic Titan chest armor in Destiny. Near-gods must believe in greater gods. But every power is finite, every life shorter than it wishes. Only an astonishing mind can truly appreciate just how tiny it is when set against the known universe; and how insignificant the known becomes when it is devoured by what isn't seen and can't be comprehended. As darkness begins to claim their ragged souls, you look ahead to find a great power pouring out of you—a face of fire and golden light. That blazing wonder, a gift from the great-eyed god, is their salvation. Or are you? Perhaps you are the greater god now.